Sony might not yet be ready to roll out its own Internet TV service for the PlayStation 3 but the company is launching an original interactive HD video show to be distributed through the game console’s online service. In a rather surprising, and perhaps risky move, the show is not being made available for free. Instead, the first episode will be offered at an introductory price of $2.99, with an annual subscription costing $24.99 and comprising of 13 episodes. To sweeten the deal a little, for a limited-time-only, annual subscribers will also receive a copy of the PlayStation Network game “Calling All Cars”. Starting this week, new episodes of Qore will be made available the first Thursday of every month in coordination with the weekly PlayStation Store update. Judging by comments left in a number of gaming forums, early reaction has been largely negative in light of Sony’s decision to charge access to what many are seeing as a glorified video podcast coupled with game demos that are currently offered for free. At the same time Sony is talking up the show’s ability to deliver brand and product tie-ins, saying that Qore “also provides advertisers with a new class of interactive advertising through rich media executions, video trailers, active ad pages and contextual branding”. Qore is being produced in partnership with Future US, Inc., publisher of PlayStation: The Official Magazine, and will be presented by Veronica Belmont. It’s not clear if the show will be available to U.S.-based users only or offered worldwide. 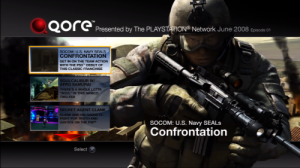 Moving forward, Sony says that Qore is the first in a series of planned original content for the PlayStation Network. More over at the official PlayStation blog. But the xBox has the Zune media store! I purchased the first month to see what it was like. Very week, and despite paying for it you are constantly bombarded with advertising clips over and over again. If they are charging then it should be commercial free. The PS3 is still pretty steep in price I can see, but I found a nice site that offers free ps3 to select places in the US. It’s a nice site I recommend you check it out. Click on the link under gaming consoles to see more information.